Vincero (g. by Stratum). 2 wins. See below. Kanpai (f. by Snitzel). Placed at 3 in Aust. Beau Victory (g. by Rock of Gibraltar). Placed to 2017-18 in Aust. MISS VICTORY (Numerous). 14 wins. See above. Mr. Vic. 7 wins from 1400m to 1800m in Argentina. Mr Victory Up. 4 wins at 1000m in Argentina. Victorius Rye (Catcher in the Rye). 4 wins at 1200m, 1400m to 2018-19 in Argentina, 2d Palermo Clasico Jamelao, L, Clasico Farnesio. First at Last. 6 wins-1 at 2-to 1400m in Brazil, Cristal Classico Armando E Carlos Alencar, Classico Presidente Fernando Jorge Schneider, 2d Cristal Classico Emanoel Pata, Classico Girceu Lopes, Classico Aniversario de Porto Alegre. Kosher. 4 wins to 1200m to 2018-19 in Brazil, Gavea Prova Especial Old Tune. Victorioso Van (Van Nistelrooy). 2 wins-1 at 2-at 1300m, 1500m in Peru, Monterrico Clasico Manuel Quimper, 3d Monterrico Clasico Ricardo Ortiz de Zevallos, Gr.1, 4th Monterrico Clasico Polla de Potrillos, Gr.1. Miss Vincitora. 4 wins-1 at 2-at 1000m, 1200m in Argentina, Palermo Especial El Centauro. VISA PARADE (Parade Marshal). 5 wins-4 at 2-from 1000m to 1600m in U.S.A. and Argentina, Palermo G.P. Santiago Luro, Gr.1, G.P. Montevideo, Gr.1, San Isidro Clasico Congreve, Gr.3, 2d Palermo G.P. Polla de Potrillos, Gr.1, Clasico Peru, Gr.2, Clasico Guillermo Kemmis, Gr.2, Golden Gate Berkeley S., Gr.3, 3d San Isidro G.P. Dos Mil Guineas, Gr.1, G.P. Jockey Club, Gr.1. Sire. VICTORIA PARADE (Parade Marshal). 6 wins at 1100m, 1400m in Argentina, Palermo Clasico Asociacion de Propietarios de Caballos, Gr.3, La Plata Handicap Haya, Handicap Chusca, 2d La Plata Clasico Jockey Club Brasileiro, L, Especial Obra del Padre Mario, 3d La Plata Clasico General Manuel Belgrano, Gr.2, Clasico Wilfredo Latham, L, Palermo Clasico The Japan Racing Association, L, 4th Palermo Clasico Carlos Tomkinson, Gr.2. Producer. VALIENTE FITZ (Fitzcarraldo). 6 wins in Argentina, Palermo Clasico Gobierno de la Ciudad de Buenos Aires, L, Handicap Haras Argentinos, L, 2d Palermo Clasico Coronel Miguel F Martinez, Gr.2, Handicap Malvinas Argentinas, L, 3d Palermo G.P. de las Americas OSAF, Gr.1, Clasico Old Man, Gr.3. Vistoso Nov (Romanov). 7 wins-1 at 2-at 1000m, 1400m in Argentina, San Isidro Handicap Wagram, Handicap Picacero, Handicap Diamond Jubilee, Palermo Handicap Capablanca, 3d San Isidro Clasico Santiago Lawrie, Gr.3, 4th San Isidro Clasico Pippermint, Gr.2. FIGARO FIRE (Fire Slam). 3 wins-2 at 2-at 1000m, 1100m to 2018-19 in Argentina, La Plata Clasico Club Hipico de Tandil, L.
Race Record: 13 Starts 2-3-2 A$74,225. 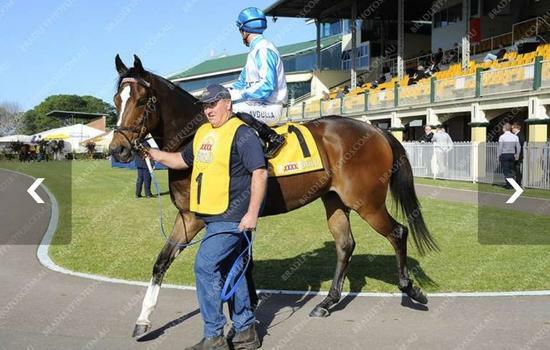 2 wins at 1000m, 1150m in Aust.